Capouch Livestock is a family owned and operated business specializing in “Choice, Quality Calves.” With over 20 years experience with calves, we pride ourselves with Wisconsin’s finest dairy-type Holstein heifers, big-boned growthy Holstein bulls, and crossbred beef calves. 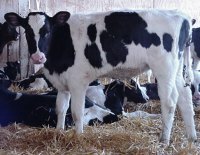 Our “baby” calves range in age from 5 days old up to 14 days old, and are delivered right to your farm upon your approval. Our “started” calves range in age from 10-12 weeks of age, and are raised right here on our family farm in a specially designed baby calf barn in which the best conditions are kept for getting calves off to a good start year round. The “started” calves had been kept on an extensive vaccination program beginning on Day 1, and would be delivered to your farm preconditioned, weaned, and fully vaccinated. With our years of experience, it has always proved worth it to spend the extra few dollars per head needed to purchase these “Wisconsin Choice Quality Calves.” With more and more customers experiencing the difference between these calves, and other calves, customer demand for quality calves is increasing, so be sure to give plenty of notice so we may better serve you. If you are considering the purchasing of calves, we will be more than willing to assist in any way we can and can also ensure that your decision to purchase some of these “Choice Quality Calves” will be the most profitable decision you can make. If you are considering purchasing calves, we will be more than willing to assist you in any way we can and ensure you the decision to purchase some of these “Choice Quality Calves” will be the most profitable decision you can make. We look forward to working with you for many years to come.